Dozens of people gathered Thursday on the south plaza of the capitol to rally against extended incarcerations. Some came to call for the release of Kevin Ott, who is serving a life sentence for drug trafficking. Religious leaders, former inmates, and lawmakers all stood before the capitol’s front steps as they spoke Thursday on the necessity of criminal justice reform in Oklahoma. The speakers addressed dozens of people who gathered on the capitol’s south plaza throughout the afternoon to attend a rally promoting sentencing reform and strengthening the rehabilitative services provided to state inmates. Many of those who spoke or came to show support for a loved one or friend behind bars told stories of drug addictions that led to incarceration. Dixie Pebworth, who served more than 10 years on drug and weapon charges, told the crowd he was initially told he was a lost cause and given an 80-year sentence. Pebworth said while he was lucky to have the opportunity to turn his life around, many inmates find there is little to help them adapt to life after incarceration. “Because there’s no programs, there’s no help, no way to keep reaching (inmates), and it makes it very difficult,” Pebworth said, standing near a line of posters with the faces of incarcerated loved ones lined next to the podium. The state is doing a poor job of rehabilitating offenders, said State Rep. Bobby Cleveland, R-Slaughterville, and needs more drug and mental health programs for inmates. He told the crowd 22 percent of state inmates re-offend within three years of release. Terri Watkins, spokeswoman for the Oklahoma Department of Corrections, told The Oklahoman Thursday the state’s recidivism rate is 23 to 25 percent for male offenders and 13 to 14 percent for females. Sitting near a voter registration table set up by the rally’s organizers, Cleveland said the growing prison population and low correctional staffing rates are a product of poor legislation. “The problem we’ve got in our prison system is not Governor Fallin, it’s not Director Patton, it’s not the correctional officers, it’s the legislators, passing bills that keep people in longer and not funding correctly,” Cleveland said. Cleveland has an interim study scheduled later this month that will evaluate how the state can benefit from smart on crime initiatives. He said he also hopes to reintroduce an altered form of a bill from last session that would have revived a lost part of the Justice Reinvestment Initiative, giving inmates of crimes that require they serve 85 percent of their sentence the opportunity to earn credits for good behavior as soon as they begin serving. Those crimes are mainly violent in nature, and under current state law inmates serving for one cannot earn credits before hitting the 85 percent mark. 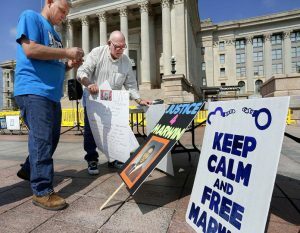 Some of those who attended the rally were calling for changes to drug sentencing that would allow for the release of inmates like Kevin Ott, who is serving life without parole in Oklahoma for trafficking illegal drugs. Ott was featured in the acclaimed documentary “The House I Live In,” which chronicled America’s war on drugs through the eyes of those affected by it. The film was screened later that afternoon in a Senate conference room. Jimmy Beeson, 66, of Cache, came to support his childhood friend John Overstreet, who is serving three life terms plus several years on drug possession charges stemming from a 1998 conviction. Overstreet was convicted for unlawfully possessing methamphetamine, oxycodone, and dihydrocodeinone, among other illegal drugs, within 1,000 feet of a park. Beeson said Overstreet was a good man who raised cattle and farmed and always went out of his way for others. “He was one of them kind of guys that would help anybody,” Beeson said. He said Overstreet developed a drug habit that consumed him and ruined his life, but after 16 years behind bars he is an old man who has paid his debt to society. “I’d like to see him get out before he dies,” Beeson said.